We’ve started distributing the 2017 Member Annual Statements (MAS) to more than 600,000 NYSLRS members. The mailing is done in stages, taking six to eight weeks to complete. School employees receive their statements first; most others should expect to see theirs by mid-July. Your statement contains important information about your NYSLRS membership, including your reported salary, service credit and beneficiaries. Depending upon your own circumstances, you may also see projected annual benefits, loan balances or past service account balances. Be sure to review the information in your statement carefully. If you need to change your address, email or phone number, or update your beneficiaries, you can use Retirement Online — our convenient and secure self-service tool. You can contact us to correct most errors, but if you have a question about your reported salary, please contact your employer. Because the information is valuable year round, after you check it over, file your MAS away securely. It’s very likely you’ll reference it again at some point in the future. Your statement also includes a member identification card, with both a registration number and a NYSLRS ID number. The NYSLRS ID is new this year, part of our upgrade to a new computer system. When the upgrade is complete, we will phase out the old registration numbers and replace them with the NYSLRS ID. As identity theft becomes more and more prevalent, please help us protect you and your personal information. Reference either your registration or NYSLRS ID number — not your Social Security number — whenever you contact us. When you receive your statement, be sure to clip out your ID card. Save it in a secure and easily accessible place, so you’ll always have your NYSLRS identification numbers handy. Check out our interactive, online presentation. It features a page-by-page explanation of your MAS as well as answers to common questions. View the entire presentation, or go directly to the information you need. We can provide MAS reprints once we finish mailing statements — usually by mid-July. You can contact us at that time if you need to order a reprint. Content last revised June 7, 2017. This entry was posted in Breaking News, Members and tagged beneficiaries, ERS, ID card, Information is the Key, know your benefits, loan balance, MAS, Member Annual Statement, members, New York State & Local Retirement System, NYSLRS, NYSLRS ID, PFRS, Preparing to Retire, Service credit on May 13, 2015 by NYSLRS. Your Member Annual Statement is automatically mailed to your employer as long as you remain on payroll. If you leave public employment, we mail your Statement to the home address we have on file for you. Myself and 2 co-workers did not receive statements last year, Was on mailed out. Is it possible to still get last years? We apologize for the inconvenience but unfortunately, we are unable to reprint your Statement from any year other than the current one. As you know, we mail your Statement to your employer, who then distributes it to you. Please check with your employer to see if it can be located. As the employer, we always got the statements sorted Alphn by building, This year they came by building-but in retirement number order. How can I prevent this from happening again? As you know, in February we send employers a letter telling them the Member Annual Statements (MAS) will be sorted by Registration number order unless they request a different method. If they want to request a different method, we instruct them to use the last field in the monthly report to do so. The last field in the monthly report has a column width of five spaces. Those five spaces can be used by the employer as a form of coding in order to have MAS sorted by reasons other than by just registration number order. If the employer wished to have the MAS sorted in alphabetical order, he or she would enter 00001 in the last column of the monthly report for the first employee with the very first place on the employer’s roster alphabetically and so on. The employer can implement any sorting system they want using this method. We have one of our staff members researching your case. We hope to have more information to you shortly. We apologize for the delay. Most members can expect the process to take approximately 12 months before a decision is made. Please understand the disability retirement process varies from case to case, especially since it requires receiving medical documentation from sources outside of NYSLRS. If you have other disability retirement questions, we feature some frequently asked questions about the process on our website. If you have filed an application and have specific questions, please contact your examiner. Will our retirement statements be available through the online system? Wouldn’t that help streamline things ? We are releasing Retirement Online in phases. In future, you will be able to choose how you receive your annual statement, including a digital version that will be accessible through Retirement Online. My statement has an “arrears” balance. What is that and how do I resolve this. I am currently employed by a employer participating in the plan. I am a reinstated tier IV member. Unfortunately, the NYSLRS Social Media team does not have access to your retirement account information. 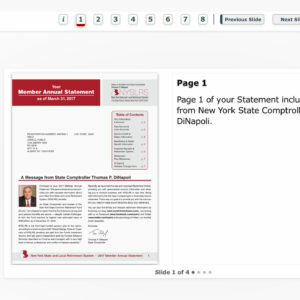 We suggest that you email our customer service representatives using our secure email form (http://www.emailNYSLRS.com), and one of our representatives can review your account to address your questions. Filling out the secure form allows us to safely contact you about your personal account information. Please allow five to seven business days for a response.